I attended LA Ballet’s second weekend of their new ballet Celebration in Redondo Beach last Saturday. This is my sixth LAB performance, though half of them have been The Nutcracker, so it’s extra exciting to see something brand new. I read it would be a combination of George Balanchine and Sonya Tayeh choreography, but that is the extent of my knowledge of what the evening would bring. The program was divided into three pieces, Balanchine bookending Tayeh’s world premiere of My Greatest Fear. The first piece was entitled Raymonda Variations. Raymonda is a ballet originally staged in Russia at the turn of the century. Balanchine revived the full length ballet in the 1940′s, and extracts of the ballet in the 50′s, 60′s and 70′s. LAB’s extracts consisted of nine of Balanchine’s staged variations. First, an opening piece with corps de ballet (but some are singled out for solos later) in medium flowing tutus, and introduction to the lead ballerina (Monica Pelfrey) in a blue pancake tutu. LAB has very talented dancers. But what I always notice, if my seats are good enough, is how young they are. It’s wonderful to see such fresh faces on the stage, but it comes at a price. The main weakness that I notice at every show is when there are two or three dancers doing a combination across the stage, it is rarely ever completely synchronized. One dancer is a beat behind, one has her arm too high, or one is noticeably better (which reminds me of recitals with standouts, not professional ballet). That being said, the piece was beautifully staged and many of the dances were wonderfully danced. Pelfrey performed a pas de deux with Christopher Revels that was beautiful. Balanchine’s choreography is so interesting because you could easily mistake the piece for a classical one staged one hundred years earlier. But the lifts and the holds are unique and modern. Instead of Revels’s hands on Pelfrey’s hips to dip her in an arabesque, he does it one-armed, with his right arm across her waist to reach her right side—and the result is stunning. When dancing a pas de deux, most of the thankless work falls on the male dancer. He is there to make his ballerina look good. So he must be solid in all his holds and catches when she balances, or does turns, so she looks clean and controlled. This couple did look a bit shaky, and when Pelfrey performed solos, she was solid and spot on. So again, I think that Revels is a very young dancer, still learning his footing. Variation V, danced by Julia Cinquemani, was the standout for me. She was perfect. Also wonderful were Grace McLoughlnin and Isabel Vondermuhll—the first with a hop arabesque finale across the stage that I have never seen before, and the second with an extremely difficult turn combination she pulled off brilliantly. If nothing else, Balanchine challenged his dancers and staged many of these variations to stay on pointe during the turns and combinations, which is harder than it looks. LAB took on the challenge quite well, and while the other two pieces looked very impressive, I would wager that this classical piece was the hardest to dance. The second piece was a world premiere by So You Think You Can Dance choreographer favorite, Sonya Tayeh. Entitled My Greatest Fear, the piece is plainly about death, which was reveled to us before the curtain was drawn. The men wore only tight black pants, and the women wore black leotards so revealing that only a dancer could pull one off. Maybe it’s my own particular taste, but I really do love modern dance in pointe shoes. Modern dance on its own has a tendency to teeter too closely to performance art at times. But when the choreography is modern dance and the dancers are ballet trained and on pointe, it can be so beautiful and emotional. Such was Tayeh’s piece. It begins with the entire cast frozen on stage before going into frantic movements. Throughout, one can feel the heaviness that seems to be carried around on all of their shoulders, which contrasted with the pairings’ lifts, which looked as light as a feather. Even with the knowledge that the dances were about fearing death, it was hard not to see them as already dead, in a personal state of purgatory. I was blown away with how beautiful the extensions and lines were, especially with the juxtaposition on how pain and ugliness were emanating beneath the surface. The men especially stood out in this number. Tyler Burkett’s solo was exquisite and the partnering was so solid, it really spotlit just how powerful these dancers can be. Tayeh’s piece closed to Arvo Pärt’s Spiegel im Spiegel, which was beautifully fitting to the visual of all the dancers joining to slowly wave to the audience, perhaps letting their limb speak for their body as a surrender flag. To close the evening was Western Symphony, another Balanchine choreographed ballet. Although I knew it was ballet, I definitely felt like I was watching an extremely well danced version of Oklahoma! 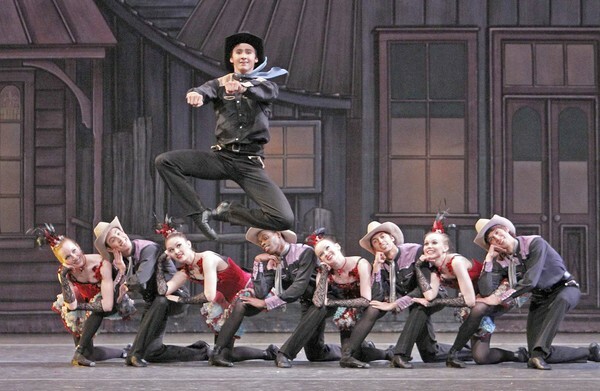 and the dancers might break into song with The Farmer and the Cowboy Should be Friends at any moment. A cheesy backdrop of an Old West town was the perfect setting for the saloon girls and cowboys to dance in front of, as they sported all the colors of the rainbow. All but one dancer had black tights and dyed black pointe shoes, giving their costumes the absolute musical theater look. Extremely upbeat numbers were fun to watch and you could not help but to smile at the theatricality of it all. It could be because we live in Los Angeles, where everyone is “also an actor,” but I was delightfully impressed with how much character and sass each dancer put into the numbers. Without it, the dances would have fell flat, even if danced perfectly. Which, for the most part, they were. The company seemed confident, as if they were having just as much fun as we were. That is, after you give in to the extreme goofiness of it all, while still realizing you are at the ballet and not watching the barn raising from Seven Brides for Seven Brothers. I found it to be the parts of a musical I enjoy the most, the dancing. It was a happy way to end the evening, but did not stay with me the next day, like Tayeh’s piece. For more information on the Los Angeles Ballet, please visit www.losangelesballet.org. Next in their Season 5 lineup will be Giselle in May.